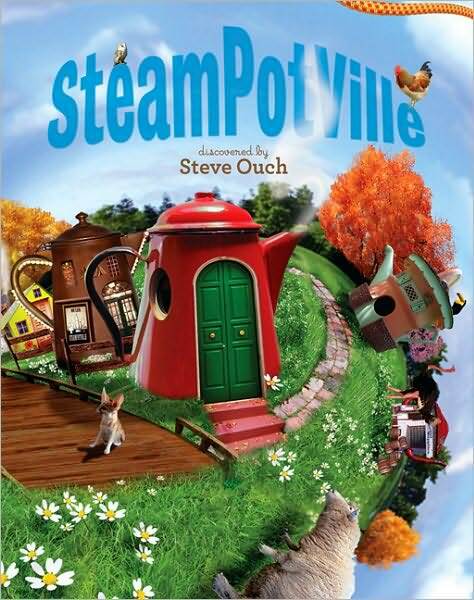 You can now pre-order Steve Ouch’s SteamPotVille on many retailer sites. Running Press’ pub. date is April 27, 2010. One part Where’s Waldo, two parts I Spy, and three parts Monty Python: pop them in a blender, hit spin, and you get the topsy-turvy world of SteamPotVille! Everyday in SteamPotVille is extraordinary—cats are mooing, monkeys are riding on horses, and cows are flying through the air! Each spread showcases a unique, lush, never-before-seen landscape that draws one into this magical town. Readers will be enchanted to visit the pages again and again looking at the eye-popping artwork. At the end of the book, children are invited to become residents of the town and to revisit the pages looking for hidden animals, objects, and people. But is SteamPotVille just a dream or does it really exist? Steve Ouch has a degree in international business and currently works as a social media consultant. He has worked with Intel, Twitter, and Facebook leading social media campaigns. He has a strong web presence and summer 2009 he made monthly movies for Ford’s viral video campaign while traveling around the country to promote the Ford Fiesta. In May 2008, he self-published SteamPotVille. Ouch lives in Portland, Oregon.